The visual cortex of humans and other primates is composed of two main information pathways, called ventral stream and dorsal stream in relation to their location in the brain. The traditional distinction (Ungerleider and Mishkin 1982; Goodale and Milner 1992) talks about the ventral “what” and the dorsal “where/how” visual pathways. In fact, the ventral stream is devoted to perceptual analysis of the visual input, such as in recognition, categorization, assessment tasks. The dorsal stream is instead concerned with providing the subject the ability of interacting with its environment in a fast, effective and reliable way. This second stream is directly involved in estimating position, shape and orientation of target objects for reaching and grasping purposes. 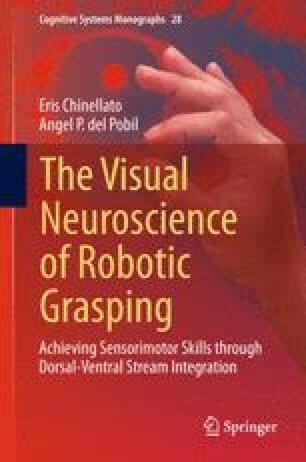 The tasks performed by the two streams, their duality and interaction, constitute the neuroscientific basis of the research described in this book, and this chapter is devoted to a detailed explanation of the related concepts.